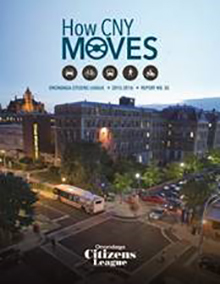 The Onondaga Citizens League, a community program of University College, released its newest study, “How CNY Moves.” The year-long study looked at what cities, towns, county and village authorities can do to take a “people-centered” approach to development that encourages a safe and intelligent blend of pedestrians, autos, buses and bicyclists. In partnership with the Syracuse Metropolitan Transportation Authority, Centro, the Onondaga County Planning Agency and other county and Syracuse agencies, the OCL study committee investigated a wide range of challenges and issues and made recommendations for the future of the transit system in the region. The study report is available at here. University College of Syracuse University at 315.443.3527 or ejevis@uc.syr.edu.